It’s only been out in the UK for a few days but there is already a great range of software available for the iPad. Here’s our top picks from the app store. Air Video is an app for viewing video content stored on your local Mac. Once the helper app is installed on your Mac you setup shares to your video folders, in my case movies and tv. 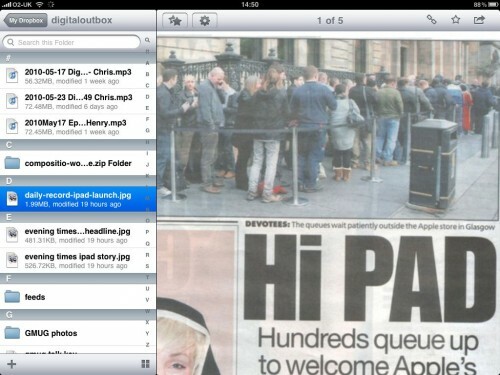 Via the iPad app you can then browse to the folder and select a video to watch. Playback is crisp and it makes for a great viewing platform. The real magic is that Air Display will do queued conversions of video files including mkv’s. If that wasn’t enough it also does live conversions. Pick an mkv, wait a few seconds and playback begins. The quality is excellent and again playback is smooth. If you have any video content stored on a Mac this really is an essential iPad app especially considering the price is £1.59. Bargain. DropBox is a cloud based file storage service. The iPad app allows you to browse your DropBox files, view them within the built in viewer and also send files to apps installed on the iPad. For example, send a pages file to Pages or GoodReader. 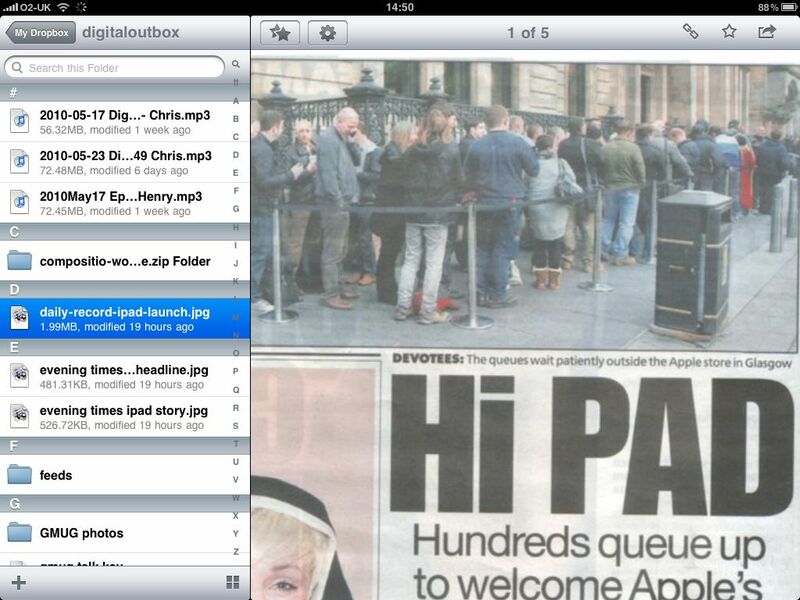 Very handy way of using files on the iPad. The app is free and the 2GB service is also free. Essential. The go anywhere note taking platform has launched with a great iPad app. Taking advantage of the increased screen size the interface allows for browsing and viewing of notes at the same time. 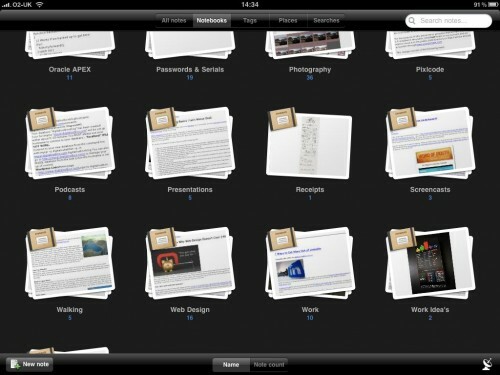 As well as notes you can store photo’s and PDF’s which again are displayed well within the app. You can also create audio notes but one thing that is lacking is an ability to sketch/draw. Like DropBox the app is free. There are many document viewing apps already for the iPad but GoodReader is one of the best at reading large PDF’s. You can transfer files to GoodReader wirelessly from your Mac or PC or vie USB using iTunes file transfer. I’ve found iTunes file transfer to be awful so stick with the wireless option. Opening even large PDF’s is trivial and navigation is clear. 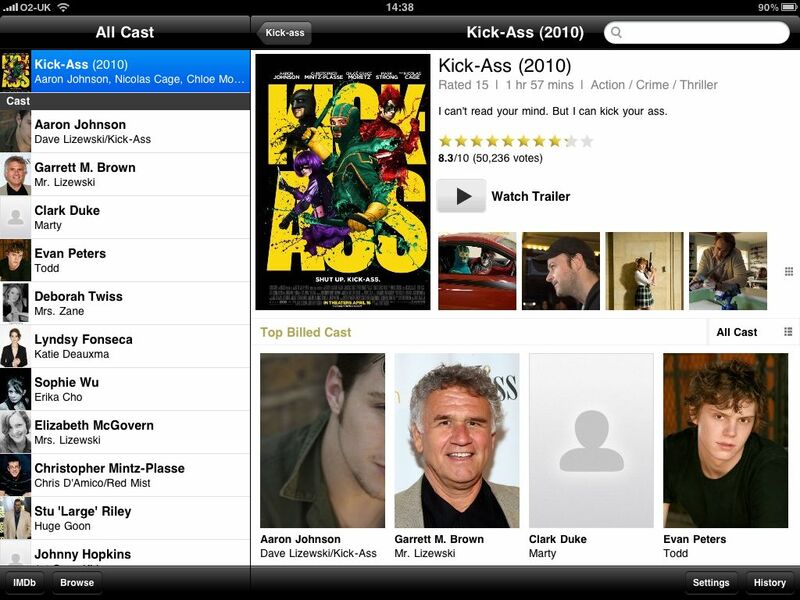 Files can be managed from within the app itself and can be starred as favourites and marked as read. What’s clear is that the iPad really does miss having a universal file management system. Each app is implementing it’s own system, each having a different UI. This is the iPads Achilles heel in many ways but that’s for another post. Compared to the other readers, GoodReader is by far the best when it comes to large image heavy PDF’s. The iPad as a games platform – just how powerful is it? 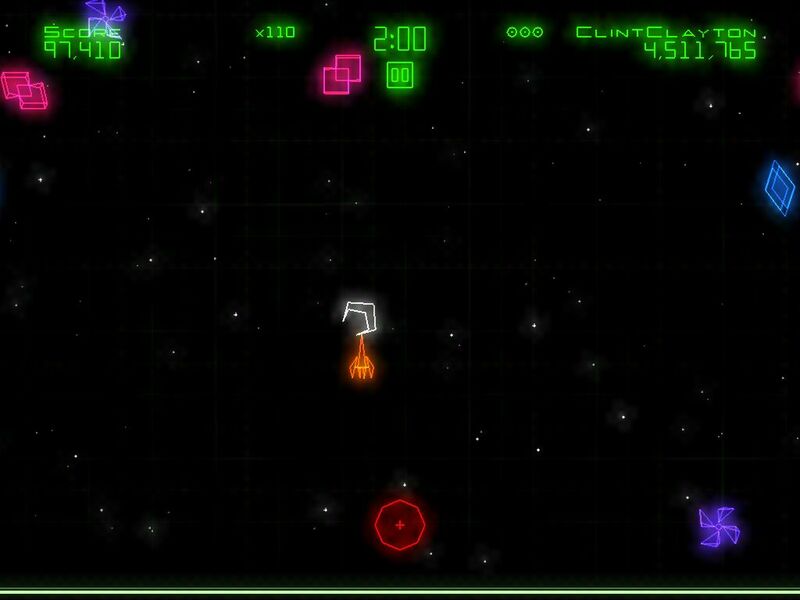 Geometry Wars is an Xbox Live arcade game that is known for it’s fast paced gameplay, old style arcade origins and an amazing amount of activity on screen. The iPad version comes with six different game modes and is graphically very impressive. Online scoreboards and achievement round of an impressive game. The only slight -ve is that touch controls don’t compare well with a joypad. When the screen gets busy there is some slowdown, but that also happened on the Xbox so that shouldn’t be seen as a particularly big issue. A heat game that really shows off what is possible on the iPad. 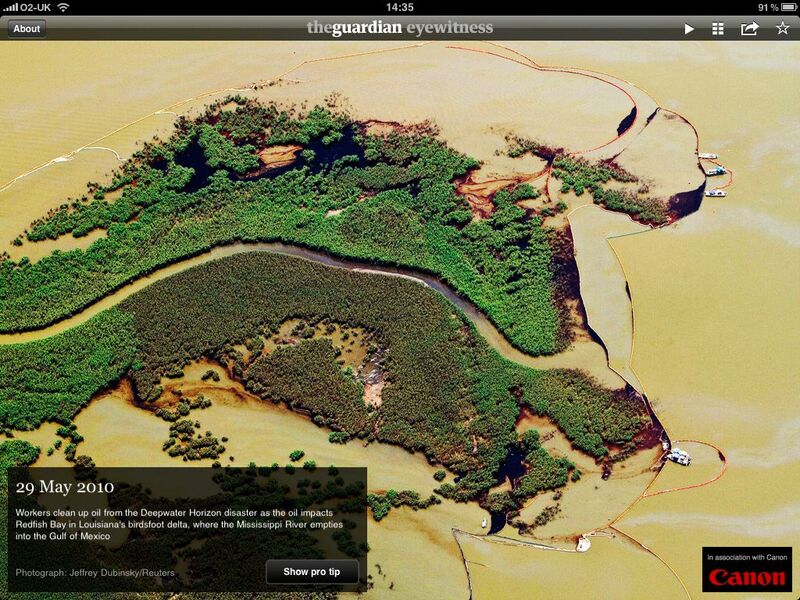 This free app from The Guardian brings the latest 100 photo’s from the Guardian’s Eyewitness photography series. The photo’s are amazing and really showoff the screen on the iPad. Each photo has a pro tip but most of these seem pretty weak. The photo’s can be saved or shared – it’s a great app to dip into every few days. If you love films then this is a must have app. Browse movies, actors, award winners and the best reviewed movies on IMDB. It’s fast and a great resource for browsing while taking in a film. One downside is that it shows movie times but for USA only, which is a shame as IMDB started as a UK site. This app was a real surprise to me . The Financial Times app on the iPad is one of the best newspapers available so far. Clear readable text and a simple but easy to use navigation structure makes it a winner. There is also a lot of video content and the market data is interactive while all the time making it obvious to the user how to back out of a chart or page. One area lacking is in sharing content but in it’s favour you can download the current edition to the iPad so making it useful for plane journeys. However this goodness won’t always be free. The app is free and access is also free but only until July 31st. After that you can only access 10 articles per month unless you pay for access which starts off at £3.29 per week. 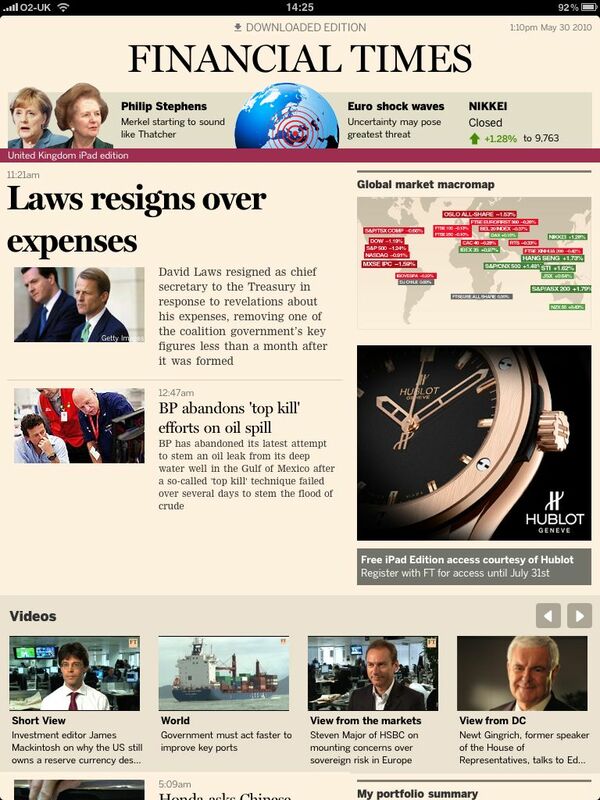 If you like the journalism on the FT then this is a snip – only the reader can tell whether this is good value. Instapaper Pro is an app for viewing web sites that you’ve previously saved. Via a bookmarklet or a large number of Twitter clients it’s easy to save a website for later reading. This might be my most used app at the moment. 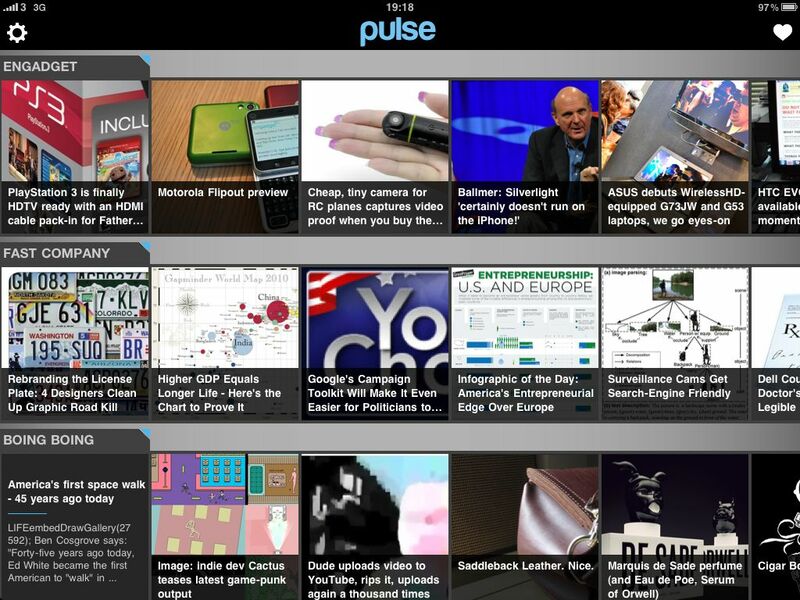 I stack up articles for reading at lunchtime or in the evening and it’s a great aggregator. Not only that but you are reading just the article content in a lovely clear screen – no adverts or other site distractions. Just the text – it’s like reading a book. You can also create archives, share starred articles but to be honest it’s just great a saving content for later reading. Essential, especially with the extra screen real estate on the iPad. 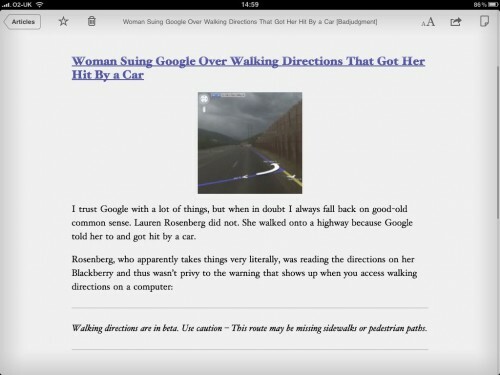 One of the key app’s that I need on the iPhone or iPad is a RSS reader that syncs well with Google Reader. While I wait for Reeder to hit NewsRack has been an able replacement. Syncing is fast, reading and navigation is excellent with support for sharing services like e-mail, Twitter, Facebook and most importantly Instapaper. 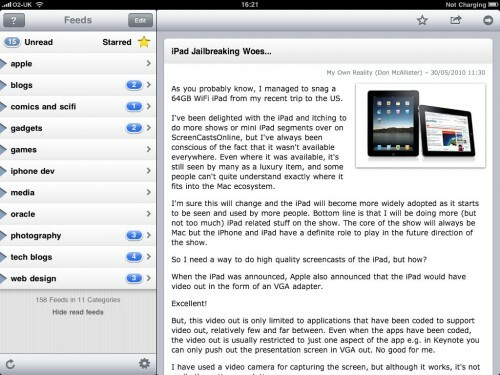 Love this app but I think the new iPad version of reeder will be my RSS feed reader of choice. Now this is nice. Just as I was finishing the article a brand new feed reader hit the iPad – Pulse. This is more visually appealing than any of the other readers so far. You can sync with up to 20 feeds and they are displayed visually in a grid. It also updates pretty quickly and instead of manually adding RSS feeds there is a smart search which allows you to search and browse feeds and add instead of typing in an address. Sharing options are limited but more are promised – a lovely app that really shows of the iPad well. So there you have it – our current iPad recommendations. This will likely change quite radically when the market matures and iPhone OS 4.0 hits so we’ll definitely be revisiting later this year. One genre I haven’t really covered in this post is books and magazines. The iPad is an almost perfect size for reading books and comics or browsing magazines, so much so that it deserves a post all on it’s own. Look out for it soon on DigitalOutbox.